Lisa is the founder and co-captain (right) and Jacki is the captain (left) Wayne is Jacki's husband and Crew. -Las Bombas raised over $463,000 in the last 6 years! 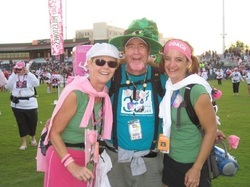 -The 3-Day recognized Las Bombas with the Most Money Raised in Phoenix in 2008 & 2009 with $330,000 for both years! Click here to watch Lisa speaking at the 2009 Breast Cancer 3-Day in Phoenix (only a 5 minute clip). Click here to donate to our team.